You are here: Home > News > UAH Challenges Conservation Area Demolition Approval. 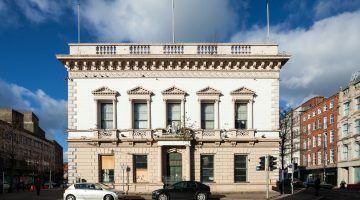 On the 2nd of October 2018 the Ulster Architectural Heritage Society issued Judicial Review proceedings against Belfast City Council to challenge the lawfulness of their decision, at a Planning Committee meeting, granting permission to demolish buildings situated on Upper Queen Street and Wellington Street in Belfast. The buildings in question are in the Belfast City Centre ‘Conservation Area’ and are therefore afforded enhanced legal protection. One of the buildings is understood to date back to circa 1860. It is also understood that the buildings represent the last of their era in that particular location, emphasising the importance of going to court to challenge their demolition and thus open up opportunities for heritage enhancement in the Conservation Area. The Society successfully took similar actions on planning processes in 2010 and 2012 against the then Department of Environment Planning Service which ensured that the nearby ‘Athletic Stores’ was saved from demolition, leading to its recently completed renovation as a distinctive and profitable Belfast heritage asset. It is surprising and regrettable that the Society has found it necessary to approach the courts yet again on what is well established process regarding heritage protection. Nicholas Quinn, Solicitor from O’Muirigh Solicitors, who represents the Ulster Architectural Heritage Society said that the challenge relates primarily to the way in which the Belfast City planners treated the planning application, given its protected status in a conservation area. He said that his client seeks to argue that the relevant Planning Committee who granted permission for the demolition was not adequately informed of material planning policies dealing with the demolition of buildings in a conservation area, with the result that their decision is vulnerable to challenge.